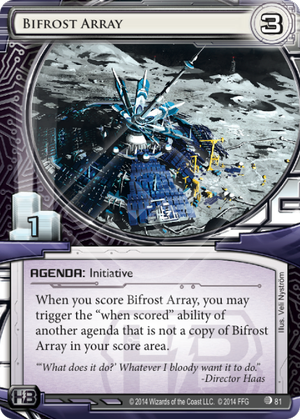 When you score Bifrost Array, you may trigger the "when scored" ability of another agenda that is not a copy of Bifrost Array in your score area. This could replace Gila Hands Arcology in a HBFA deck that wants to use the Accelerated Beta Test ability - i.e. The Foundry: Refining the Process. It also puts more counters on a scored Efficiency Committee which combos with Shipment from SanSan. The Foundry hasn't seen success so far, and HBFA has not been putting up especially strong results recently. If that changes, consider this card in the 2x 3/1 agenda slot. The other competitive HB archetype is glacier, and in those decks this could trigger a Priority Requisition a second time. For decks that run the 3322222211 agenda split, this could also push you towards running 3x Efficiency Committee instead of a 3/2.